Suspend it 28-32” above the tabletop. Locate it 12” in from the edge of the table to avoid hitting your head. 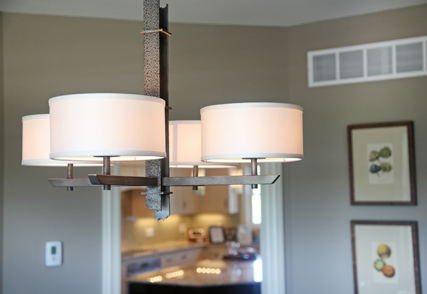 What’s the right proportion of the fixture in your room? Our rule of thumb is 2.5 to 3” for each foot of ceiling height. An 8-foot ceiling prefers a chandelier that’s 20-24 inches in height. And the diameter? Add the height and width of your room together and treat the sum as inches. 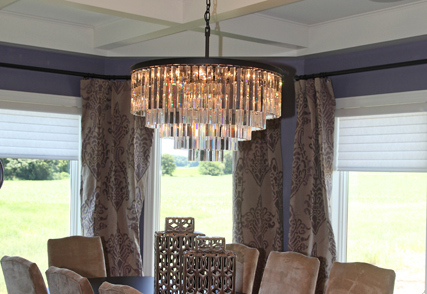 A 15 x 18-foot dining room would look great with a chandelier that’s 33” in diameter. Now that you know the “rules” remember, your personal style guides the effect you’re trying to make. An example? Two chandeliers over a worktable or long, rectangular dining table has a “why not?” attitude that can be very appealing. And linear fixtures over a rectangular table can be longer than the above suggested 33”, especially a frame-fixture. It’s open airy look seems to take up less mass.